In this data recovery case, the client’s drive had multiple failure points. However, the primary reason this Seagate desktop hard drive was not detected was because the hard drive spindle motor had seized. The hard drive spindle motor is responsible for spinning the drive’s platters. There are many instances where a hard drive will fail to spin up due to a failure of its PCB to deliver power to the motor. A hard drive can also fail to spin up because the motor itself has failed and cannot set the platters in motion. This can be due to improper handling, such as turning a drive over or dropping it while it’s still running. It can also happen if the lubrication that keeps the motor spinning freely dries out as a result of age, or gets gummed up with small amounts of debris and dust. When the lubrication fails, it introduces enough unwanted friction to cause the motor to overheat. The hard drive this client sent us for data recovery was an older model of Seagate Barracuda hard drive. Instead of the SATA interface today’s hard drives used, this Seagate hard drive relied on the PATA (Parallel ATA) interface, also commonly referred to as IDE. The use of PATA declined with the introduction of SATA in the early 2000s, and hard drive manufacturers gradually ceased production of drives with IDE interfaces. Our cleanroom data recovery engineer Kirk performed the initial inspection of this Seagate hard drive’s internals and noted that the hard drive spindle motor and magnetic read/write heads had failed. The heads had impacted with the surface of the platters, preventing them from spinning. Fortunately, there was no visible rotational scoring on the platters. After taking the condition of the hard drive into account and presenting a price quote which the client approved, the drive went back into the cleanroom. Charles, another of our cleanroom engineers, took over the case from there. In order to recover data from this Seagate desktop hard drive, Charles needed to get it spinning again and ensure that the platters were dust-free. If any dust or debris remains on the surfaces of a hard drive’s platters, the read/write heads can collide with it. This would kill the heads and scrape off some of the magnetic coating that contained the hard drive’s data. Cleaning off the platters to prevent any further damage and irretrievable data loss required the use of our burnishing tool. The seized hard drive spindle motor could not be fixed so easily. 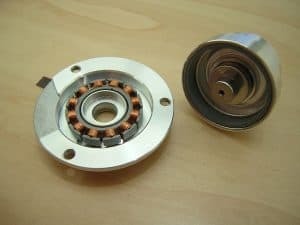 The lubricated bearings that are supposed to keep the platters spinning freely are not meant to be removed from the motor, replaced, or re-lubricated without rendering the motor inoperable. It may seem sensible to a layperson to remove the hard drive’s spindle motor from the chassis and replace it with a healthy donor motor. But our data recovery engineers have found it actually yields much better results to do things backwards and replace the entire chassis. Great care had to be taken with the customer drive and donor drive’s components to ensure that the platters could be read safely after setting them into the donor chassis. Charles was able to begin recovering the client’s files, although the drive still handled roughly. After recovering around 66% of the client’s files, Charles sent a preliminary list of the recovered data to the client. To improve the hard drive’s rough performance, Charles replaced the drive’s read/write heads with another set of donor parts. Our data recovery engineers were able to read 54.7% of the drive’s binary sectors and 99.9% of the drive’s file definitions. 94.2% of the client’s files were completely recovered. Damage to the platters meant that not all of the used area on the drive could be read, but the client’s most critical Microsoft Word documents had been successfully salvaged from the failed hard drive. We rated this data recovery case a nine on our ten-point scale.